But back to the Hidden Sight Word Coloring Worksheets! 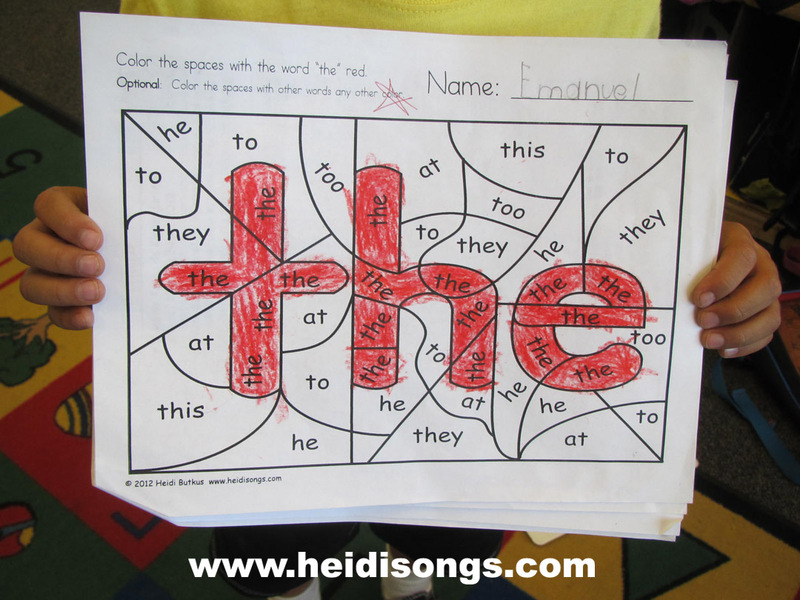 After creating the first one, I attached it to a homework packet for my students once I had introduced our first sight word, “the.” When the children brought back their homework, I asked them to show me what they had done, and many of them were very excited about their papers, and were proudly showing them off! Since then, we have done a few more for homework, and a few in class. It seems that these worksheets are just the right amount of challenge for the children; they are not too hard and not too easy. They can be done independently with most of them getting them right. They are almost self-checking, in that when the child is done, he sees that the word itself comes up. Of course, I’ve discovered that the brighter children in the class can tell what word is written in the middle of the design before I’ve even told them what word to look for, of course. But they don’t seem unhappy at all by this; in fact, they seem quite pleased with themselves! This little boy likes to use lots of bright colors! In choosing the “distractor” words (the wrong answers) to go in the sections around the outside of the target word, we tried hard to choose words that would be very close visually so as to really make the kids think before coloring and be good for visual discrimination as well as reading. 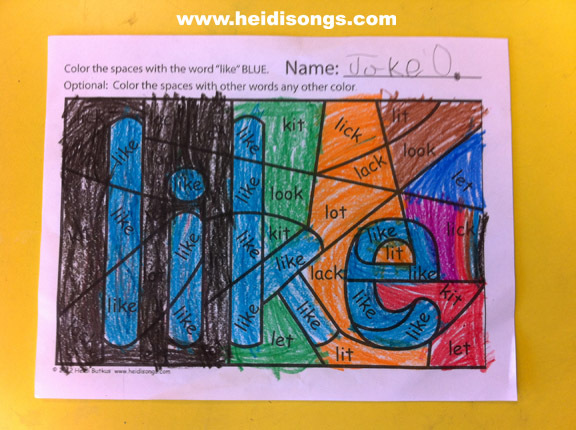 Another thing I like about it is that although there is one color designated for the target word, the instructions leave the rest of the coloring as “optional,” and allow the children to make them the color of their choice. My intention was to allow teachers to tell the class that they should either color it or not color it, at their discretion, based on their own classroom management needs and how much time they need to fill. 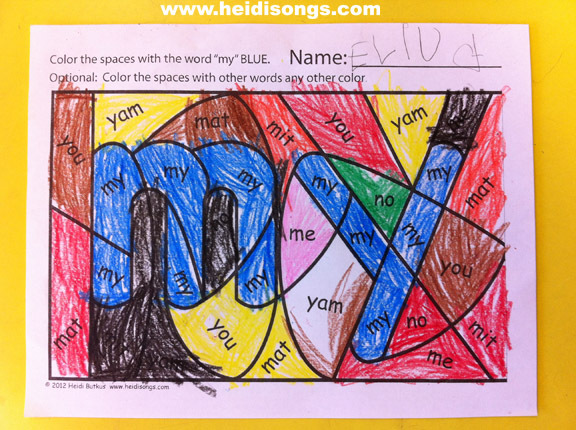 Here is an example of one page done for homework where the child colored only the required spaces. Children doing this at home for homework can then color the outside sections whether or not they wish to, and that is exactly what my students did, of course! Some of them really had fun with it and colored in everything with lots of bright colors, and others that don’t enjoy that sort of thing as much did the minimum. So it all worked out exactly as I wanted! 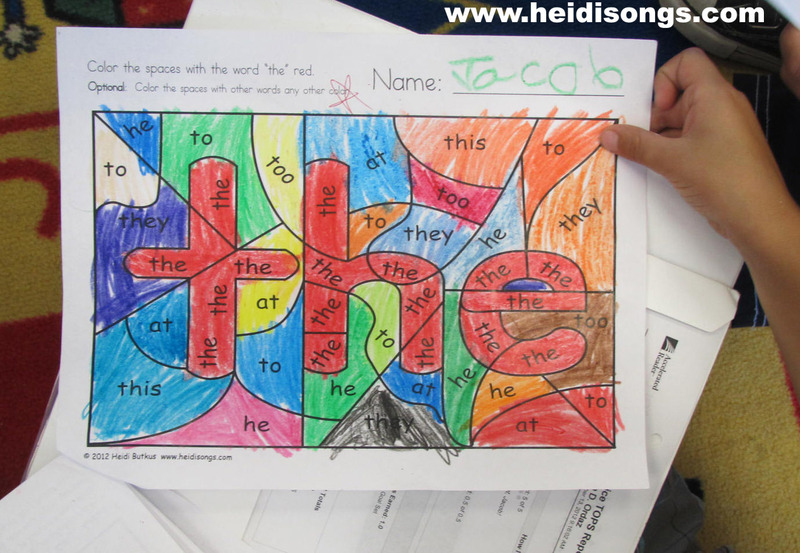 Here is an example of a page done for homework in which the child chose to color in the whole page. I like giving them options! We are including a couple of them as freebies so that you can try them out and see if your students respond to them as well as mine did. I find them to be easy to use and very flexible as far as classroom management is concerned. I hope you enjoy using these as much as we are! The set of Hidden Sight Word Worksheets are for sale here. They include all of the words in Sing and Spell the Sight Words, Vol. 1. We'll be making the worksheets for the remaining volumes of our Sight Word DVD's ASAP. If there are other words you would like included, please let me know! Also, I would like to give a great big shout out and THANK YOU to the wonderful teachers of the Wisconsin Kindergarten Association for inviting me to come speak in their beautiful state! I had a great time meeting so many nice people and sharing my ideas, and they treated me like a queen. If you live anywhere nearby and are looking for a great conference to go to, consider WKA's annual Kindergarten conference next year! They are trying to get the wonderful and fabulous Deanna Jump to come speak next year, although she is as yet unconfirmed. Don't miss it!!!! Follow me! Did you enjoy this post? Do me a favor and share it with your friends! And follow this blog by signing up for my email updates here, or follow on Bloglovin', or follow me on TPT! I'm also on Pinterest, Facebook, Twitter, Instagram, Google+ and YouTube, too! Don't forget to sign up for our email newsletter for special deals and promo codes that you won't find out about anywhere else. I can't wait to try these with my kids. Thanks! Thank you for this wonderful freebie. I would love to purchase a packet if you have one! Thank you for this freebie! I know my kinders will love this! I've been waiting for these!!!!!!! Is there a "quick link" to get to them that I missed? Thanks for the great idea. Hugs from southern IL! Heidi you have done it again!!! I just love all of your resources. Thank you!! I can not wait to Let my students use these. I love, love, love these!!!! When will you have your full set available for purchasing? ASAP! Krista in our HeidiSongs office is working as fast as she can. It took her about two and a half weeks to make this first set. (She works for us part time, about 20 hours a week doing computer work and digital artwork. It's tedious stuff, unfortunately, and she hits the wall after a few hours and has to take a break, I understand. So you can probably expect a new set every two weeks or so. I will continue to announce the new sets, as well as any other new products on my blog. There is also a HeidiSongs newsletter that you can sign up for. Go to this link and scroll down to the bottom right: http://www.heidisongs.com/index.php. Heidi, you have done it again! I love these, can't wait to try them with my kids! These look great, Heidi and Krista. I looked for a link to the first set and did not find one. Be sure and share that as soon as you're ready to sell them. Thanks for all you and your business family do for teachers and kids. It was right there at the top of the post, I promise! I added another link in the middle of the post and yet another at the end, since you are the second person that said they couldn't find it. Thanks for letting us know it wasn't obvious! It's probably a good idea to include a link to something that's for sale at the end of the post as well anyway! I love these!!!!! My kiddos this year are slow moving and most need a lot more practice with sight words. I think we will try one out tomorrow !! Can't wait! Thanks again!! Will you make these available on TpT? No, right now they are only available on our website. Sorry! We are working on setting up a Teacher's Notebook store, but they are not on there yet. And we will be working on a TPT store eventually, with our downloadable products, too, but we are thinking of configuring them differently on TPT. They will probably be packaged so that people can buy all of the resources for each word, one word at a time. It's a bit hard to explain... but once we get it set up, you'll see what I mean. These look like so much fun! my little one is very artistic and this one look like it is just right for her. I'm glad you all like them! They have been fun for my kinders. Have you compared your list to Fry's 1st 100 words. That is the list we use in our building. I think my student would love these! 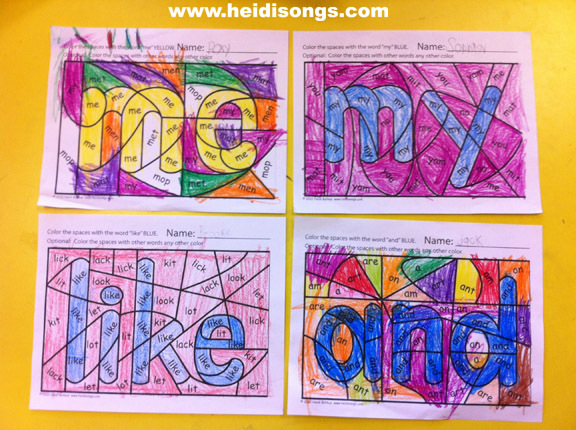 At the moment, we are simply making these worksheets to accompany the words on each of our sight word CD's. 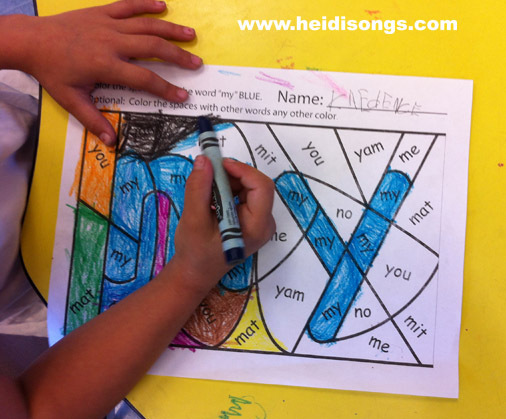 There are 140 word songs recorded, so it usually covers most of the words that kinder teachers need, at least. I am still planning on doing more sight word CD's, but I need to complete some other projects first. If there are certain words that you need done, you can always suggest them! These are lovely! I will keep them in mind for when my preschooler is ready for them. Sooner than later I'm sure. I'm finding that my older students (1st grade+) do great with their sight words so far...but we are having a bit of trouble with the word "what". I didn't see it in any of the packs you have available though. Will make a hand-drawn one for the time being. Thanks for the idea! Today I am going to tell you about a very simple and fun idea that my class really enjoyed! 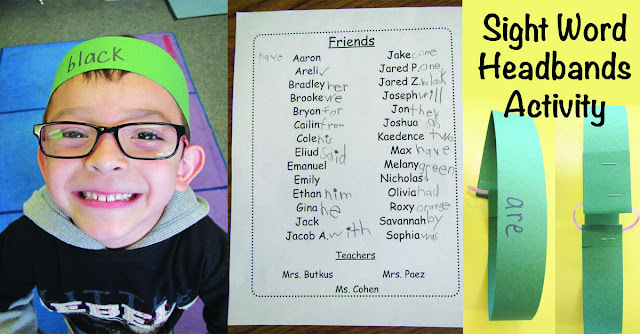 It’s called Sight Word Headbands, and you do it in a whole group setting, so it is really easy to manage. I already had this list of names typed up, so I just told them to write the word next to their friends’ names. 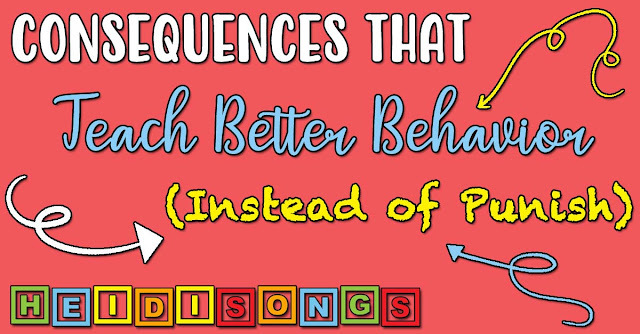 It can be difficult to think of effective consequences that actually teach BETTER BEHAVIOR than simply punish a child for a discipline problem! But after teaching 28 years, I have come up with quite a few ideas that I have tucked away in my bag of discipline tricks, and I am excited to share them with you today! These are all (well, mostly!) positive consequences that I have used successfully in Transitional Kindergarten (TK), Kindergarten, first grade, and second grade. And now since we are a PBIS (Positive Behavior Intervention and Supports) school, it will be handy to have a fresh look at this list. I hope that it's helpful to you, too! 1. Start with the Positives! 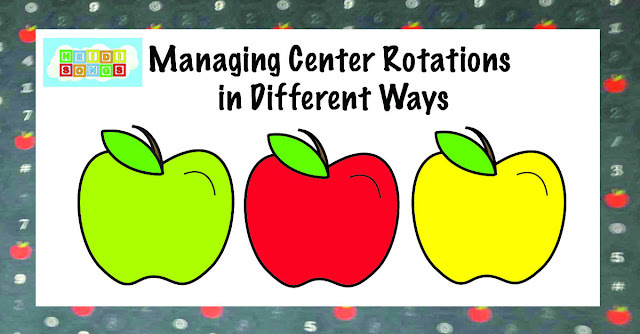 When I do my centers, I do them with both math and language arts running at the same time. One group does language arts with me; another group does math with my aide; another group works independently at different types of things, such as word work, and the last table does an art project with a volunteer. The art project is usually a book making project that is related to our unit of study, and takes a week or two to complete. However, I often get emailed questions from teachers whose administrators have different expectations of their teachers. In the first question below, the administrator expects the teacher to do one solid hour of math, and then one solid hour of language arts. So here are my suggestions on how to make a learning center rotation that is similar to mine, given these perimeters. There are also links to several other blog posts that I have written with more information on running centers. 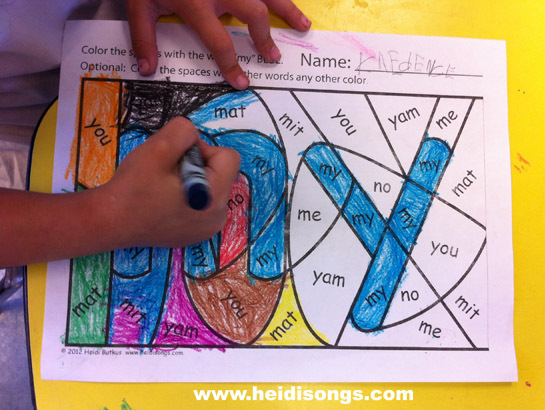 Heidi Butkus of HeidiSongs We strive to make learning fun, active, & EFFECTIVE with music and movement, PLUS lots of innovative ideas for primary kids! !